I first saw the duo of British drummer Bill Bruford and Swiss keyboardist Patrick Moraz in 1982, at New York City's now defunct Bottom Line, and later in 1983, at D.C.'s now defunct Bayou. Bruford and Moraz had released two albums, the acoustic "Music for Piano and Drums", and the electronic "Flags". Consequently, these recordings and others have been reissued on Bruford's new record labels: Summerfold and Winterfold. 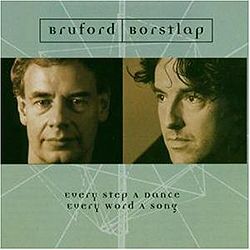 Now, on this new CD, "Every Step A Dance, Every Word A Song", and a DVD titled "In Concert In Holland", Bruford this time teams up with Dutch keyboard master Michiel Borstlap, in duets culled from their 2003-2004 European tour. Although the duo's efforts are rooted in jazz, there are hints of the progressive-rock/New Age flavor of "Flags", where Borstlap employs synthesizer for choruses and textures, and Bruford's well known polyrhythmic beats and syncopations that propel this beautiful musical journey.